Annie Stegall and Will Stegall, Masters 2013. This year was the seventy-seventh Masters. My great-grandfather got tickets a long time ago and always loved it. Once my grandfather was old enough, he started going and has now gone to fifty of them, my dad has gone to twenty, and this year was my first. 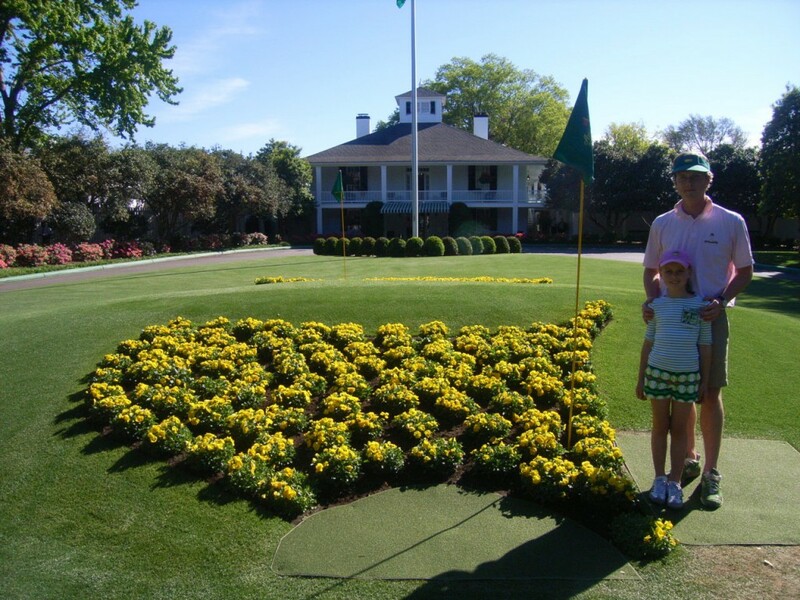 Before I tell you about golf, I am going to tell you about the Augusta National golf course. 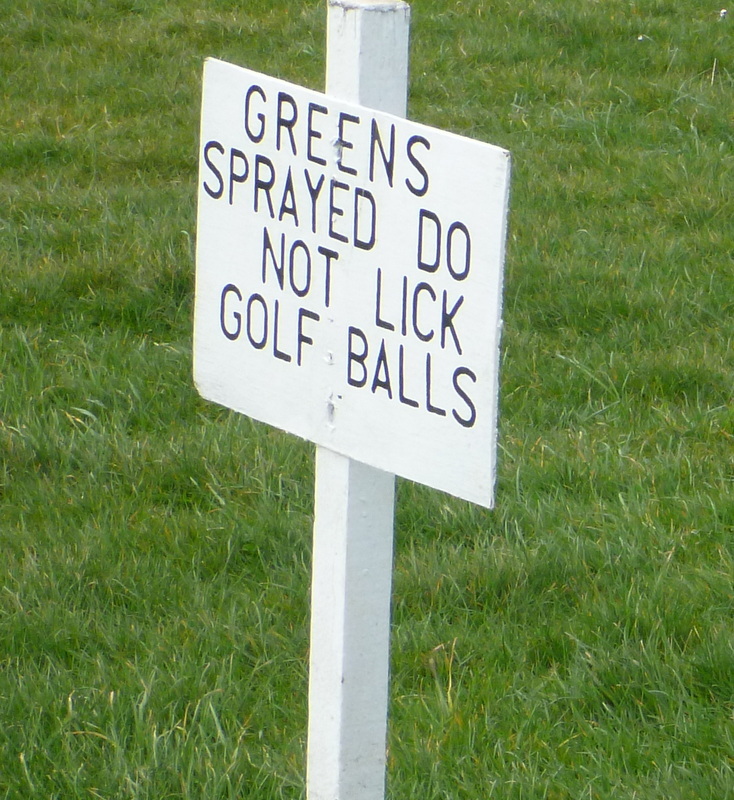 First of all, let me tell you how green it was! It was so perfect that at first I thought the grass was fake. The grandstands were green, the concessions stands were green, the trash picker-uppers’ uniforms and their pokey things were green, along with the sandwich wrappers and even the beer cups. And now to the main thing: the golfers. They could hit the ball so high and so long I couldn’t believe my eyes. I loved that you could be so close and nobody would tell you to step back. It was awesome watching an eighth grader beat Bubba Watson and other Masters winners. Angel Cabrera rolled me one of his balls and the forecaddie of the 16th hole gave me Tiger Woods’s tee. I also got an autograph from Brandt Snedeker. My dad and I kept a notebook of bets on who would win, who would have the lowest round each day, and who would hit the closest on each hole. I crushed my dad. He predicted Brandt Snedeker would win but I said Snedeker would have a bad round at the end and Adam Scott would win. I was right! 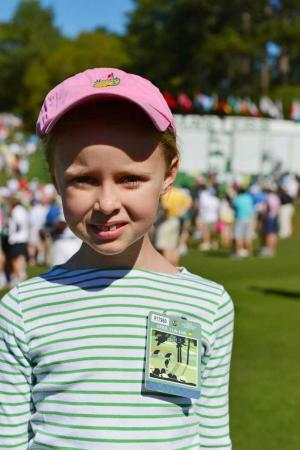 On Saturday, Annie was picked by the Augusta Chronicle as the Junior Patron of the Day, so she got her picture in the newspaper, too (see below). Next year, I’m going get her press credentials, then turn everything over to her. Annie Stegall: MyUsualGame.com special correspondent and Augusta Chronicle Junior Patron of the Day, Augusta, Georgia, April 13, 2013. One of the best things about working on my book The Making of the Masters was getting to know Kathryn Murphy, shown in her home in the photo above. 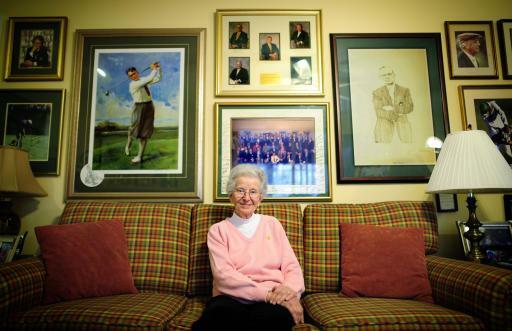 She first worked on the tournament, as a secretary, in 1962, and she became an indispensable assistant to Clifford Roberts, Augusta National’s co-founder and the tournament’s original chairman. She knew an extraordinary number of Masters facts, and if I suddenly wondered about something truly obscure, such as who had teed off fourth in the sixth Masters, she knew exactly where to look it up. She loved the tournament, and she loved the club, and neither would have been the same without her. Murphy had many opportunities to observe Roberts. She told me that she would sometimes find him hunched over his desk on autumn afternoons, working in the gloom. She would flick on the lights, and he would straighten up in his chair but show no other sign of having noticed the change. She always kept a stenographer’s pad next to the phone by her bed at home, because there was no telling at what hour he might call to dictate a letter. Among her many contributions to my book was her insider’s perspective on the conclusion of the 1968 Masters, when Roberto de Vicenzo signed his scorecard for one stroke more than he had actually shot, and was kept out of a playoff with Bob Goalby. A few sportswriters and others have alleged that Roberts must not have wanted a foreigner to win, and had therefore made a ruling that gave the green jacket to an American. 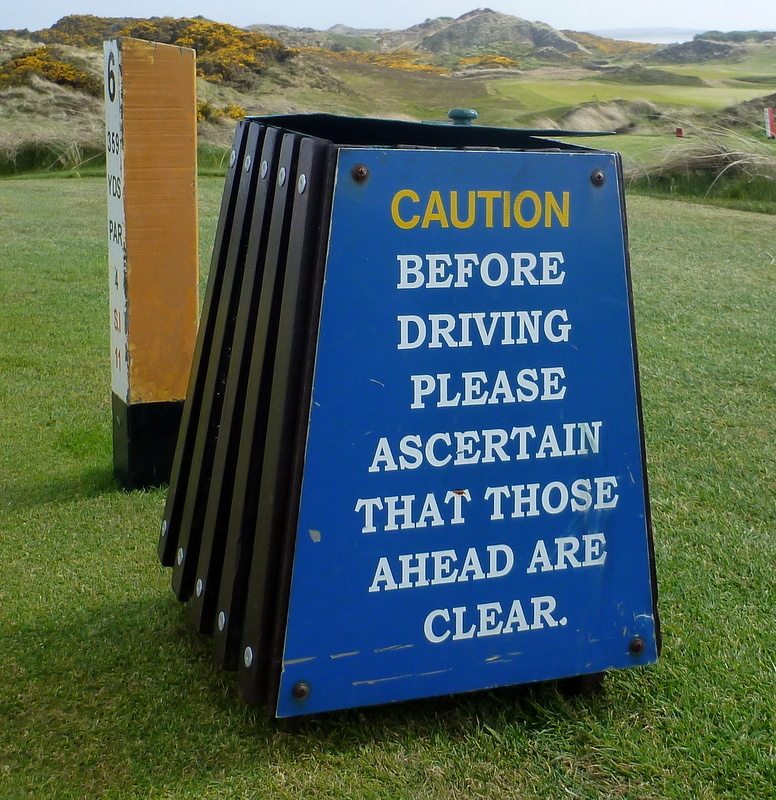 But the ruling was the only one possible under the Rules of Golf at that time, and it was made not by Roberts but by the tournament’s chief rules official, Isaac Grainger, who was a past president of the U.S.G.A. Furthermore, as Murphy told me, the idea that Roberts had been out to get de Vicenzo was absurd, since it was partly at Roberts’s urging that he had come to play in the Masters in the first place, in 1950. (That year, his manager wrote to accept his invitation to compete in “the Annual Teacher’s Competition” — a mistaken retranslation from a Spanish version of the invitation.) The two men were close friends, Murphy said, and de Vicenzo and his wife often spent Masters week in the home of Wilda Gwin, who was another of Roberts’s secretaries. De Vicenzo’s birthday fell on Masters Sunday in 1968, and the tournament staff, with Roberts’s assistance, planned a surprise party for him. Murphy told me that she remembered sadly throwing away the birthday cake when it became clear that holding the party would now be impossible. Roberts always held a dinner for the tournament winner at the end of each Masters, and Murphy told me that that night he broke convention by inviting de Vicenzo to attend as well. She said that Roberts worried that the outcome had harmed both men—by depriving de Vicenzo of a shot at the financial bonanza that followed a Masters win and by overshadowing the spectacular charge that Goalby had made in his own final round. Like all Masters winners, Goalby received a silver cigarette case on which had been engraved the signatures of all the players in the field. Murphy said that Roberts quietly had an identical box made for de Vicenzo, as a private acknowledgment of his ordeal, and that he asked J. Richard Ryan, the attorney who handled the club’s television and movie contracts, to offer his services to both men as an agent—an occupation that had just begun to have an impact among the better players on tour. He especially hoped that Ryan could help de Vicenzo make up for opportunities he had foregone. This year, Murphy visited the club twice during Masters Week, spent time with her family, including a great-grandson, and threw a weekend Masters party. She watched the final round on TV, and was delighted when Adam Scott won. About two hours later, she died, at the age of eighty-one. 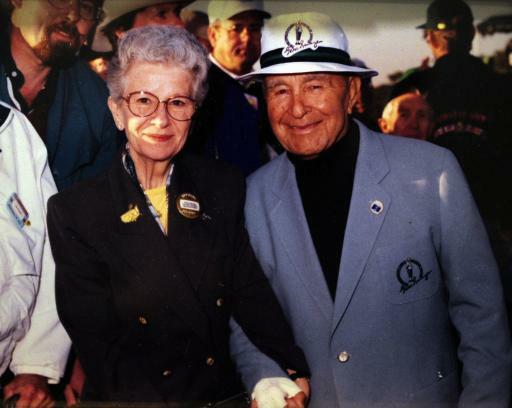 Kathryn Murphy and Gene Sarazen. Photo: Augusta Chronicle.